Our donuts are all made fesh in-store each day! Unlike most others, Frank's Supermarkets donuts have that fresh, old-fashioned taste and quality that you've come to expect. We have over 30 varieties from which to choose, and they're made fresh every day! Come in for one, or pick out a boxful to share. *Please place your order at least 48 hours prior to your event. Additional time may be required to fulfill holiday orders. Planning a birthday party, holiday or game-day get together or other special event? Frank's Supermarkets has the perfect dessert to please all your guests! Choose from original eeryday selections, as well as sesonal specialties to add an element of fun and excitement to any celebration. We offer a huge selection of fresh, read-to-go cakes in our stores, or place an order for a special custom cake for your party or event. Our bakery team uses only the best ingredients for a dessert you'll be proud to present. Place your order with confidence that the cake you pick up will truly be somethin gspecial. Just ask our past customers! Custom–Decorated Cakes Are Our Specialty! 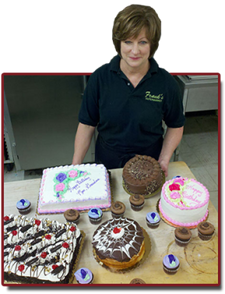 Betty Hollenback, our talented cake decorator, will help you create the perfect cake for any occasion. Betty has been with Frank's Supermarkets since the Chesaning store opened in Showboat plaza in April of 1980. Betty loves baking pies and cakes for Frank's Supermarkets (as well as in her spare time!). One of her favorite things to make is children's birthday cakes. We are very proud to have Betty on our team at Frank's Supermarkets. Frank's has so many choices of different flavors, designs and sizes of our custom decorated cakes that it's impossible for us to list them all! Looking for fresh ideas? Betty will be happy to help you design a stunning creation! Whatever the event, let us create the centerpiece of your special celebration.